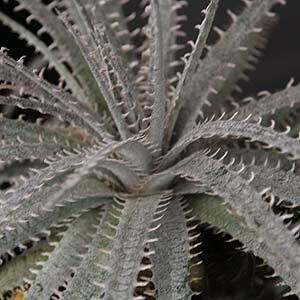 Not the most widely grown Bromeliad, Dyckia plants are only just beginning to become available in their more desirable forms. 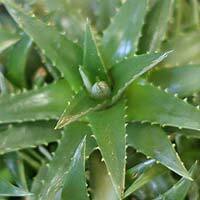 Excellent as potted specimens some with very attractive foliage on an easy care plant. It is the foliage and its symmetrical round habit that makes these plants such a standout in a container. Dyckia are a terrestrial bromeliad that prefer a sunny position in a well drained soil but moist, they grow well in the garden and can look great in pots or containers. Originally from South America they grow well in cooler climates than many brooms and are perhaps a little ‘under used’ in the garden. Lots of variety in this genus, D. brevifolia (pictured right) is sometimes called the ‘Pineapple Dyckia’. 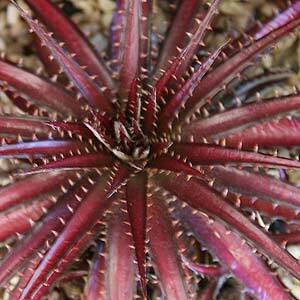 Now these are a spiky little bromeliad, so work carefully when you are dividing or replanting them. One of the main problems seems to be to much water in the winter months, so be careful here. We use a diluted seaweed fertiliser when they are in active growth and a little slow release fertiliser at the beginning of the growth cycle, early spring. D.dawsonia is a sought after species. These are a suckering plant, and propagation is easy by division. You will need to be careful as the spines are very sharp. OK we are stumped, seems these are difficult to find in Australia… Let us know if you hear of anyone selling them.